Israel’s UN Ambassador criticizes leftist organizations for taking part in a UN Security Council meeting on "settlements". 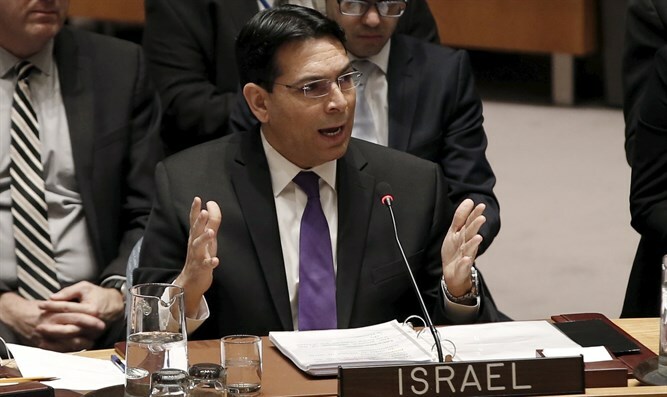 Israel’s UN Ambassador, Danny Danon, on Friday blasted leftist organizations Peace Now and B’Tselem for taking part in a UN Security Council meeting on Jewish communities in Judea and Samaria. The members of the Security Council had convened the special meeting, entitled “Illegal Israeli Settlements: Obstacles to Peace and the Two-State Solution” and initiated by Egypt, Malaysia, Senegal, Angola and Venezuela. El-Ad also accused Israeli security forces of ill-treatment of Palestinian civilians and called on the Security Council to take actions against Israel, said a statement from the Israeli UN mission. Danon harshly criticized the Israeli organizations that took part in the meeting, saying, “Just two days after anti-Israel forces approved a resolution intending to sever the historical bond between the Jewish people and Jerusalem, Israeli organizations chose to slander and besmirch Israel’s good name at an event organized by the Palestinian delegation. “We will continue to fight and tell the truth about Israel despite the attempts to spread lies about us. It is unfortunate that Israeli organizations have joined the Palestinian attempts to wage diplomatic terror against Israel at the UN,” he added. The participation at the meeting by Peace Now and B’Tselem was criticized by Israeli officials on Thursday, among them MK Yoav Kisch (Likud), who said that these organizations should be cut off "because they have already cut themselves off from the discourse of Israeli society, from the people who democratically elected their leaders in the Knesset. They don't care about the terror wave affecting Israel or the constant incitement to kill Israelis."